Daddio has been as uptight as a hen on a hot griddle. According to him this being laid off is for the bums, I mean birds. He's had enough time off and can't stop thinking about all those times when he was working 10 hours a day, six days a week. "Pure heaven" and " the good old days", is how he describes it now. He forgets that his mantras were "I'd give anything to get laid off and take a break" and my personal favorite (not) "My vacation will be an eternal one, when the good Lord pulls me out of this hell hole called life". The guy is getting a tad testy having all this at home time. And he's starting to talk crazier than he usually does. The other day he grabbed my pajamas, (never mind that they were still coming off from around my neck) and tossed them into the hamper to be washed. "I've only worn those once" I said. "They have something spilled on them, they need to be washed again". "Oh" I said " put some stain spray on them". "What am I" he growls "the maid?" Well goodness sakes of course you are not the maid. You are the poor soul stuck in the house at the mercy of a bunch of inconsiderate clods who have no real clue how it is that every little thing they sloppily do gets magically undone. A plate left on the living room table somehow makes its way to the sink where on its own it chisels off the dried on melted cheese and then hops into the dishwasher. Where it joins those 16 glasses dug out from the bowels of a bedroom during a most recent archeological dig. I soooooo feel your pain Daddio, honestly I do. Remember, I was the stay at home for many years. I want you to know it's okay... I accept your apology. So the other night Daddio drove me to see Googie's show. It was about 45 minutes away and there was no sense in us going separate. He opted to stay in the car and listen to a couple of cd's and the radio while I helped the cast with their hairdos. I told him that I'd call when I was finished and I'd save us a couple of good seats. I was done about a half hour before show time and sat my can in a great seat. I started calling Daddio's cell phone. No answer. I called and called and called and called. I left a couple of messages "where are you?" I asked. "Me again, where are youuuuuuuuuuuu?" Beginning to feel like Glen Close in Fatal Attraction I gave it a rest for about 10 seconds. And I called some more. Daddio is as dependable as they come, even more so. Surely he was slumped over the steering wheel, a victim of some kind of silent killer. Or maybe he was the victim of a not so silent killer, a kidnapper or some crazed crazy roaming the parking lot looking for guys sitting in their cars listening to music. Daddio had to be dead. That would be the only reason he wouldn't answer the phone call he most certainly was expecting. Once the panic set in I wasted no time gathering my things and sprinting out of the auditorium, through the filled lobby and out into the large parking lot, dodging cars and people along the way. I was nearly breathless when I got to him. "WHAT IN THE FREAKIN HELL ARE YOU DOING?????????????????" I screeched asked. "I CALLED YOU A THOUSAND TIMES AND YOU DIDN'T ANSWER". "I HAD GOOD SEATS FOR US AND NOW I'M SURE THE'RE GONE AND WE'LL HAVE TO SIT BEHIND SOME BIG TALL GUY WEARING AN OVER SIZED PILE OF DREADLOCKS." Daddio's eyes blazed. His jaw clenched and in very slow motion, using a very low voice, he snapped said, "Hey...shut up will ya, my phone was turned to silent and just because I'm laid off.... do.... not..... think..... that you are going to talk to me like that. (He may have mentioned something about me losing some of my teeth, but I tuned him out at that point). Somehow I had insulted him greatly. I wished at that point I had some insite as to how it is exactly that his mind works??? Epilogue: This story almost ended with the narrator possibly toothless and traveling the 50 plus miles to her home on foot. What could have transpired between the time she left her mild mannered (that's a bit of a stretch, but...) husband in the car listening to music and the fire breathing dragon she found waiting there when she went to retrieve him??? When Daddio finally stopped foaming at the mouth he told her....while enjoying an hour or so of cheerful blues ballads, a few little cheerful ditties about rotten days and unfaithful women, Daddio heard a new one, one he'd never heard before. The lyrics told of a man that lost his job and had to learn to cook and clean...they called him Mr. Domestic. 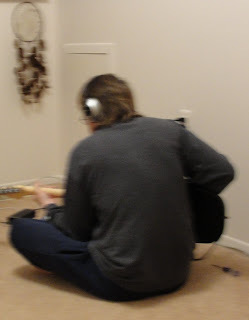 Daddio working on a blues song. (It probably won't have anything to do with housework and laundry).